4.1 out of 5 based on 57 bloggers and 10 commenters. 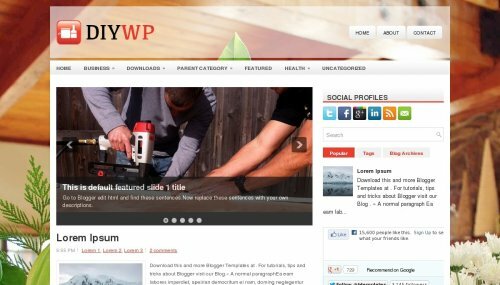 DIYWP is a free blogger template adapted from WordPress with 2 columns, right sidebar, slider, social bookmarking icons, posts thumbnails, tabs and drop down menu. hello, Is there any way to change the background picture of this template easily? Thanks a lot for thist great template. the slider is not working. can you tell me what i should do? sangat cocok nih untuk blog yang bertema desain properti..
this is a vry nice tamplet. wow its a very very nice tamplet.